Mr. David Cerda, former resident of Hereford, passed away on September 10 at the age of 62. Mr. David Cerda, of Evans, Colorado, passed away Monday, September 10 at the age of 62. David was born on June 10th, 1956 to Paulino and Margarita (Garza) Cerda in Crosby County, Texas. He met the love of his life, Sylvia Davila in Hereford, Texas and, after many years, they met again and were married on April 9th, 2016 in Crystal City, Texas; together they raised their son Marc Anthony Davila. Mr. Cerda worked for many years as a driver for RCLJ Trucking in Big Wells, Texas and, after moving to Evans, Colorado, he worked for All American Pet Proteins in Greeley, Colorado. He was a high school graduate and had a passion for watching the Dallas Cowboys and loved Tejano dancing. He was a devoted husband and father and enjoyed family time when not hard at work. David is preceded in death by his father Paulino Cerda and by his sister Dora Cerda. 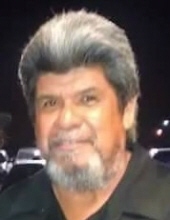 He leaves behind his beloved wife, Sylvia, his son Marc Anthony Davila, his mother Margarita (Garza) Cerda, his brother Juan Cerda of Dallas, Texas, and his three sisters: Imelda Saldana of Dallas, Texas, Gloria Morales and husband Isabel Morales of Hereford, Texas, and Rosa Linda Cerda of Hereford, Texas. He also leaves behind and many cousins, nieces, nephews, and friends, all of whom love and will miss him greatly. "Email Address" would like to share the life celebration of David Cerda. Click on the "link" to go to share a favorite memory or leave a condolence message for the family.